Be the first player to remove all four of your blocks from the board. Begin the game by rolling your opponent's blocks on a flat surface to determine which symbols will start face-up. (If a block lands on its edge, roll it again.) Place your opponent's blocks in the spaces diagonal from their home star. You may place the blocks in any space and orientation that you wish as long as the symbols you rolled remain face-up. If you and your opponent have recently played Deblockle, the player who won the previous game may go first, even if they are not the youngest. To begin your turn, roll one of your blocks into any open adjacent space. You may not roll diagonally, and you may not roll into the star space. There are two star spaces on the board marked by a golden star. Each player starts with their blocks in the 4 spaces diagonal from their home star. 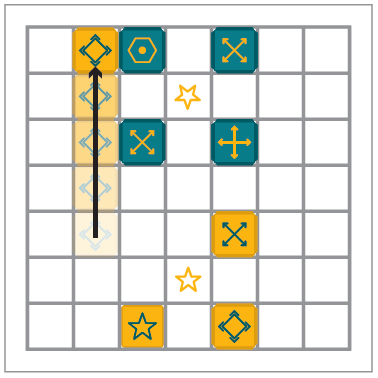 Players must move their blocks across the board and into their opponent's star space. Deblockle can be played with 1, 2, 3 or 4 blocks without any changes to the rules. If two opponents are un-evenly matched, one player might start with fewer blocks to help balance the game. You may use the suggested starting positions below when using less than 4 blocks or you may experiment with your own starting positions. Set-up rules are the same as they would be for a regular game. To add an extra challenge to the game, another rule may be added that prohibits blocks from ending a turn in a space adjacent to an opponent's block. A player may have their own blocks sitting side-by-side, but players cannot end their turn with any of their blocks touching an opponent's block. Sitting diagonally from an opponent is allowed. The Slider symbol can still be used in this game variation, however, a block may ONLY slide up to the edge of the board or up against a block belonging to the same player.